Background Treatment of juxta-articular giant cell tumor (GCT) of the bone around the knee remains a dilemma. Many authors recommend cementing, others grafting after extended curettage and others resect and replace by a modular prosthesis. Biological reconstruction remains the cornerstone of our belief in the treatment of GCT. 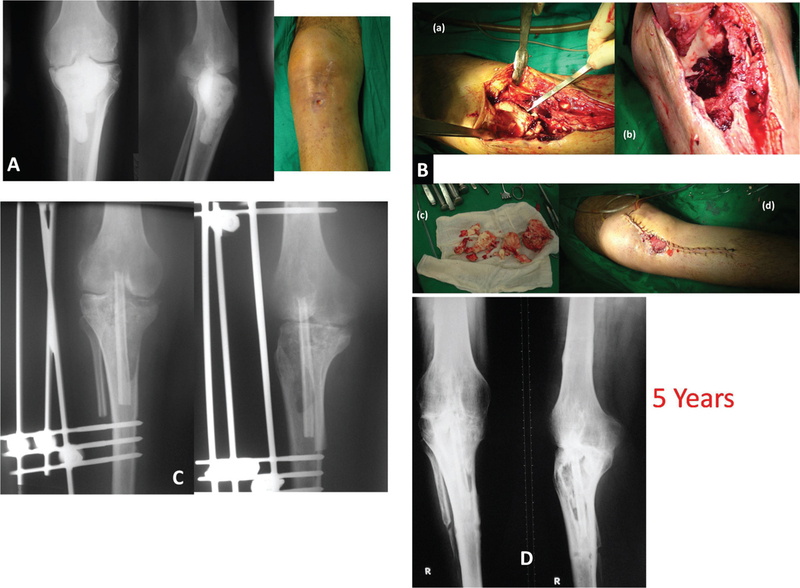 Materials and methods A retrospective review was conducted of GCT around the knee treated between 2000 and 2012 using the technique of extended curettage through a large bone window in situ pasteurization (ISP), followed by bone grafting and spanning external fixation. Thirty patients (10 men, 20 women), aged from 15 to 67 years (average 38 years) with a mean duration of follow-up of 46 months (range: 24–188 months) were identified. The GCTs were staged according to the system of Campanacci and colleagues. Six lesions were classified as stage I, 18 as stage II, and six as stage III. Four patients had an intra-articular fracture of the distal femur at the time of diagnosis. Results All 30 patients are continuously free of disease and there is no local recurrence. Functional evaluation was performed by the International Society of Limb Salvage score criteria. The average functional score was 95% (77–100%). None of the patients complained of pain and none of the patients demonstrated serious instability of the knee joint. All the patients showed union starting from 2 months after surgery with full consolidation 6 months after surgery. The fixator was removed at 4–12 months after surgery. Radiologically, 29 (97%) patients had complete incorporation of the graft (>75% of the International Society of Limb Salvage score) and one (3%) patient had partial incorporation (<75% of the International Society of Limb Salvage score). The overall average radiographic evaluation rating was 97%. Osteoarthritis of the knee joint was not seen in any of our patients. Four patients had intra-articular fracture of the distal femur at presentation; all healed eventually and did not affect the final results. Conclusion Extended curettage, ISP bone grafting, and spanning external fixation is a safe and effective procedure for the treatment of juxta-articular GCT of the bone around the knee. Giant cell tumor (GCT) of the bone is one type of giant cell-rich lesion of the bone. This benign mesenchymal tumor has characteristic multinuclear giant cells. Mononuclear stromal cells are the physiologically active and diagnostic cell type. Most GCTs are located in the epiphyseal regions of long bones. The axial skeleton − primarily the sacru − is a secondary site of involvement. Most patients present with pain, swelling, joint effusion, and disability in the third and fourth decades of life. Imaging studies are important for tumor staging and radiographic grading. Typically, these clinically active but slow-growing tumors are confined to the bone, with relatively well-defined radiographic borders. Monostotic disease is most common. Metastatic spread to the lungs is rare. Extended intralesional curettage with or without adjuvant therapy is the primary treatment choice. Local recurrence is seen in less than or equal to 20% of cases, and a second local intralesional procedure is typically sufficient in cases that are detected early. Medical therapies include diphosphonates and denosumab which are still under research . Curettage and packing with polymethyl methacrylate cement has gained wide acceptance for the treatment of GCTs of the bone, which are often large, juxta-articular tumors with a historically high rate of local recurrence. Bone cementing is the most straightforward way to reconstruct a large cavity and simultaneously restore structural integrity. According to a biomechanical study by Frassica et al. , subchondral stiffness was restored to within 98% of the control contralateral limb after the defects were reconstructed using polymethyl methacrylate. In addition, polymethyl methacrylate allows easy recognition of tumor recurrence ,, is easy to work with in filling irregular defects, and is essentially in unlimited supply, as well as being relatively inexpensive. The primary disadvantage of acrylic cementation has been the concern over the long-term biomechanical effects of a large, stiff mantle of cement adjacent to the subchondral bone and articular cartilage. The risk of subchondral cement causing damage to cartilage and subsequent degenerative arthritis has been observed . Another concern about the use of polymethyl methacrylate is the radiolucent line at the bone–cement interface . It is still unclear whether the radiolucent line is progressive and leads to loosening of the cement. Radiolucent lines frequently appear at the bone–cement interface following arthroplasty. Sometimes they are progressive and quickly expand to become an obvious area of osteolysis, resulting in gross loosening ,. The current report describes our experience with the treatment of juxta-articular GCT of the bone around the knee with extended curettage followed by bone grafting, bone marrow injection, in situ pasteurization (ISP), and fixation with spanning external fixation. Specific attention was directed toward the determination of the recurrence rate, and complications associated with subchondral bone reconstruction. For the assessment of reintegration of the grafts, the radiographic evaluation method of the International Society of Limb Salvage  was adopted, and oncologic and functional results were assessed using the Musculoskeletal Tumor Society system . Three hundred and seventy-three patients who had a histologically proved GCT of the bone were managed consecutively at the authors orthopedic oncology services in Alexandria University, Egypt, between 2000 and 2012. The method of treatment was chosen on the basis of the imaging assessment of the extent of the tumor, site of the lesion, stage of the disease, and an estimation of the quality and quantity of the remaining bone. The final decision was based on a discussion with the patient about the oncological risks and the anticipated functional outcomes of the various options for treatment and reconstruction. Thirty-four patients were collected from our database that had been diagnosed as juxta-articular GCT of the bone around the knee and treated with extended curettage, ISP followed by bone grafting, bone marrow injection, and fixation with spanning external fixation. Four patients were excluded because their follow-up was not complete. Thus, the group evaluated was composed of 10 male and 20 female patients; the mean age at the time of the operation was 38 years (range: 15–67 years). Thirteen lesions were in the femur and 17 in the tibia. The GCTs were staged according to the system of Campanacci et al. . Stage I indicates an intraosseous lesion; stage II, an intraosseous lesion with cortical thinning; and stage III, a lesion extending extraosseously. Six lesions were classified as stage I, 18 as stage II, and six as stage III. Four patients had an intra-articular fracture of the distal femur at the time of diagnosis. The mean duration of follow-up was 46 months (range: 24–188 months). Figure 1 The operative procedure: (A) the operation is done through a large bone window; (B) after adequate curettage by a hand-held curette, a high speed burr is used for more extension of the surgical margin; (C) autogenous bone graft is used to pack the defect; (D) bone marrow bloody aspirate from the donor site of an autogenous bone graft is used for more enhancement of the healing. A large cortical window was made so that the entire cavity was visible, and the tumor was removed with a hand-held curette. The cavity was then enlarged with a high-speed power burr until the bone adjacent to the tumor was removed. Often, this included the removal of subchondral bone to the level of articular cartilage. In all patients ISP was applied as an adjuvant therapy. Finally, the cavity was packed with autogenous corticocancellous iliac bone graft and bone marrow aspirated blood. In a single patient, because of the destruction of the articular surface of the tibia by previous surgery done elsewhere, arthrodesis using nonvascularized fibular graft and corticocancellous ipsilateral patellar bone graft was done. Postoperative mobilization, ambulation were normally allowed the day after the operation. While weight-bearing was allowed, first partially after 6 weeks postoperatively and full weight-bearing is allowed after full union and consolidation of the graft. The four patients who had pathological fracture were allowed to bear weight between 6 and 12 weeks postoperatively. It was reported that patients who had intralesional excision and bone graft were allowed to bear weight as tolerated between 6 and 12 weeks postoperatively . The mean follow-up time for the patients was 46 (24–150) months. During this period, the patients had conventional radiographic examinations (frontal and lateral exposures) every 3 months at the first and second postoperative years and every 6 months thereafter. For the assessment of reintegration of the grafts, the radiographic evaluation method of the International Society of Limb Salvage  was adopted, and oncologic and functional results were assessed using the Musculoskeletal Tumor Society System . Complications occurred in three patients. 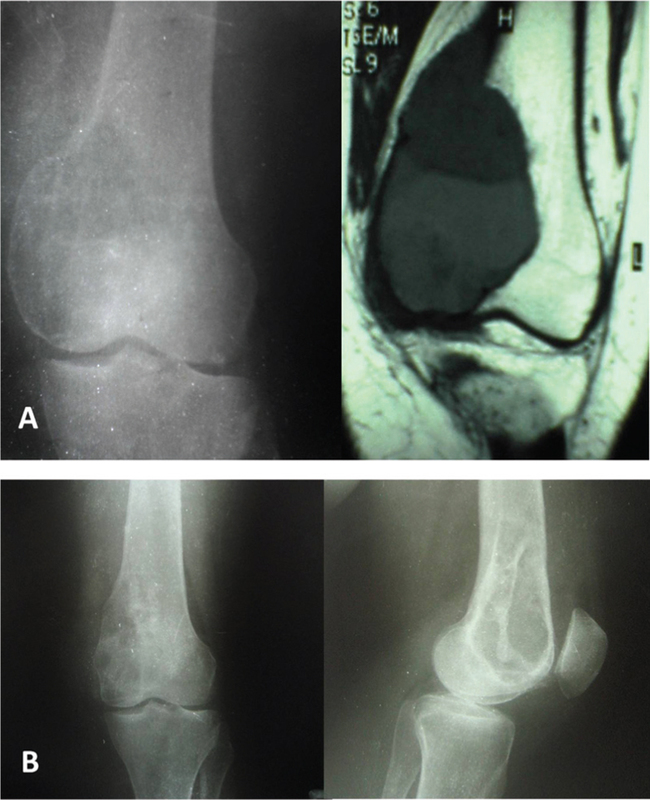 Two patients developed incongruity of the knee joint after operation but remains asymptomatic ([Figure 2] and [Figure 3]). Both patients had had a displaced intra-articular fracture of the distal femur at presentation. The other patient had had a persistent low-grade infection that was initiated by first surgery done elsewhere by bone–cement ([Figure 4]). In this patient, the bone cavity was refilled with nonvascularized fibular graft aiming at arthrodesis of the knee which was successful, but the low-grade infection remains. Figure 2 A 45-year-old-male patient: (a) radiograph at presentation showing giant cell tumor of the lateral femoral condyle of his left knee with a pathologic fracture. (b) Three years after surgery showing solid union, good incorporation of the graft with minimal clinically insignificant joint incongruity. Figure 3 A 28-years-old-female patient: (a) radiograph and MRI at presentation showing extensive giant cell tumor of the medial femoral condyle of her left knee down to the articular surface with pathologic fracture. (b) Five years after surgery showing solid union, good incorporation of the graft with minimal clinically insignificant joint incongruity. Figure 4 A 38-years-old-male patient, (A) radiograph and photograph at presentation showing extensive bone–cement used for filling a defect of his proximal tibia 6 months before, with radiolucency surrounding the cement indicating recurrence with persistent infection and sinus. (B) First-stage surgery was done: (a) the cement is removed with extended curettage of the recurrent lesion. (b) The remaining defect with extensive erosion of the articular surface of the proximal tibia and femoral condyles. (c) The removed cement and recurrent lesion. (d) Medial head gastrocnemius rotation flab is used to fill the defect with irrigation suction for 1 month, till the bacteriological culture was negative. (C) Immediate postoperative radiograph after his second-stage surgery by filling the defect and arthrodesing the knee with nonvascularized fibular graft and autogenous corticocancellous ipsilateral patellar bone graft. (D) Radiograph 5 years after surgery showing solid union and arthrodesis of the knee, but with persistent low-grade infection. The International Society of Limb Salvage graft evaluation score  was used for radiographic evaluation. Callus formation was detected at 1–3 months postoperatively ([Figure 5]). Healing occurred without additional treatment in all patients ([Figure 6]). A 32-years-old women had incomplete consolidation of the graft but with sufficient strength without any problem ([Figure 7]). The overall union scoring rate was 100% as calculated from the maximum scoring rate. Radiologically, 29 (97%) patients had complete incorporation of graft (>75% of The International Society of Limb Salvage score) and one (3%) patient had partial incorporation (<75% of The International Society of Limb Salvage score). The overall average radiographic evaluation rating was 97%. Figure 5 A 48-years-old-female patient: (a) radiograph at presentation showing extensive giant cell tumor of the lateral femoral condyle of her left knee down to the articular surface with displaced pathologic fracture. (b) Radiography done 3 months after one-stage surgery of extended curettage, minimal internal fixation, packing with autogenous bone graft, and spanning external fixation, showing the healing in progress. (c) Radiograph done 6 months after one surgery showing solid union and healing of the defect. 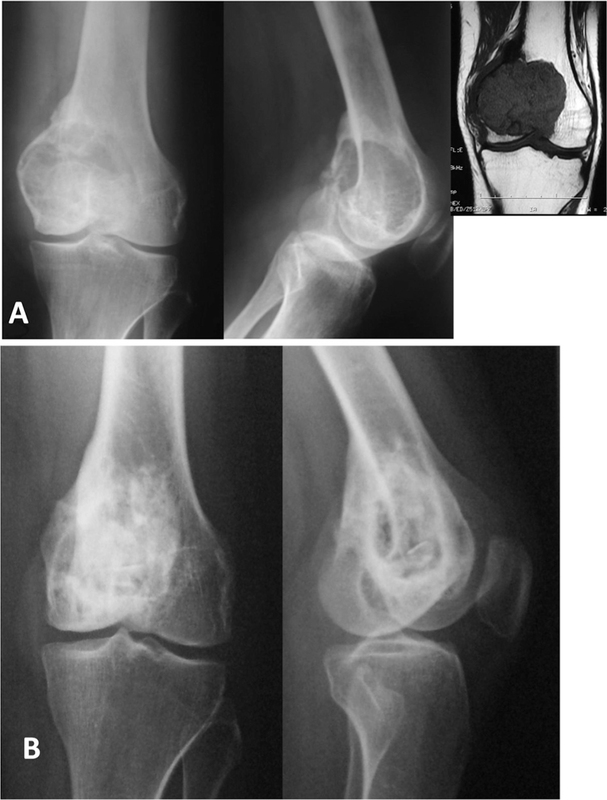 Figure 6 An 18-years-old-female patient: (a) radiograph and (b) MRI at presentation showing extensive giant cell tumor of the medial femoral condyle of her left knee. (c) At 3 years after surgery showing solid union, good incorporation of the graft. 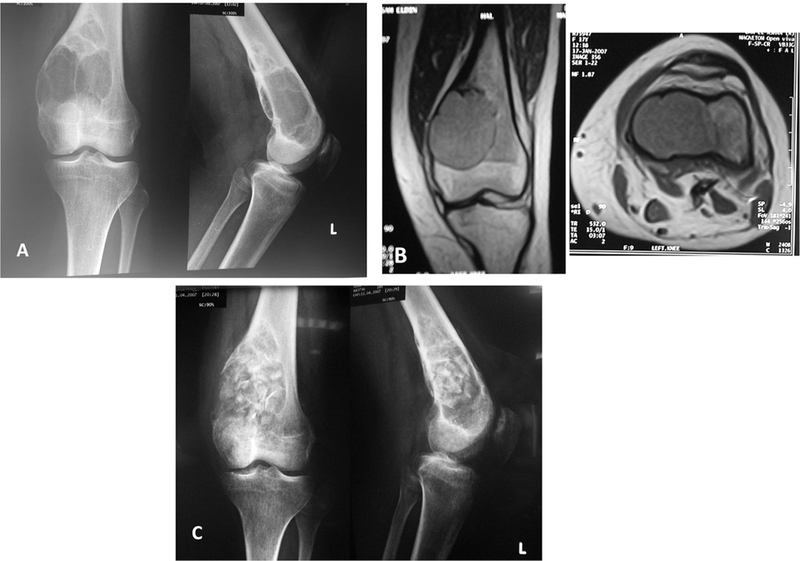 Figure 7 A 32-years-old female patient: (a) radiograph and MRI at presentation showing extensive giant cell tumor of the medial femoral condyle of her left knee down to the articular surface. (b) Five years after surgery showing good healing but with inadequate incorporation of the graft at 4 years after surgery. The overall mean of the Musculoskeletal Tumor Society  functional rating was 95% in the current patients ([Figure 8]). Figure 8 A 30-years-old-female patient: (a) radiograph and MRI at presentation showing extensive giant cell tumor of the medial and lateral femoral condyle of her right knee with pathologic fracture. (b) Radiography done 3 months after one-stage surgery of extended curettage, nonvascularized triple barrel fibular graft, packing with autogenous bone graft and spanning Ilizarov external fixation, showing the healing in progress. (c) Radiography done 2 years after surgery showing solid union and healing of the defect. Of the 30 patients who were treated with curettage and bone grafting, no patient had local recurrence. No patient had evidence of metastasis. In this study, we have studied the advantages and disadvantages of autogenous bone graft as a biologic filling material after curettage of GCT of the bone. None of the 30 patients showed local recurrence after a minimum duration of follow-up of 2 years. Incongruity of the knee joint appeared after operation in two patients who had intra-articular fracture at presentation. Historically, simple curettage of GCT of long bones was associated with a rate of local recurrence of ∼40%. Wada et al. reported of the 29 patients who were treated with curettage and bone graft, six (20%) had a local recurrence at a mean of 19. In large single-center studies of GCTs of the bone that had been treated primarily with curettage and packing with cement, the prevalence of local recurrence has ranged from 0 to 29%, after a minimum duration of follow-up of 2 years. In some relatively small series, there have been no initial local recurrences. Gitelis et al. noted no recurrences in 16 patients, and Conrad et al. reported recurrence in five of 17 patients. Overall, the rate of local recurrence for all series that have been reported to date is 9%. The recurrence rate of 0% in our study was better than that reported earlier and even lower than that of the patients treated with bone–cement at other institutions . The application of bone–cement after curettage of GCT of the bone apparently decreases the local recurrence rate. It has been suggested that free radicals and the thermal effects of the polymerization reaction may affect tumor cells left in the curetted cavity. By contrast, Blackley et al. have reported that the risk of local recurrence after curettage with a high-speed burr and reconstruction with an autogenous bone graft was similar to that observed after the use of cement and other adjuvant treatments. This study suggests that the adequacy of the removal of the tumor rather than the use of adjuvant modalities, such as phenol or liquid nitrogen, is what determines the risk of recurrence. We believe that low local recurrence of GCT is related not only to the use of adjuvant but also to the use of a large cortical window for meticulous and aggressive debridement. It is unlikely that adjuvant agents can prevent recurrence if the tumor has not been adequately removed. Bini et al. have reported that 11% of patients experienced degenerative arthritis after subchondral cementing. In the present study, two patients who had intra-articular fracture at presentation developed incongruity of the articular surface but remains asymptomatic. For GCTs with intra-articular fracture, the two-stage operation advocated by Alkalay et al. has been advised. The first stage includes curettage, open reduction, autologous bone grafting, and temporary bone–cement filling. Following bone union, the second operation includes recurettage, cryosurgery, and cementing with stable internal fixation. 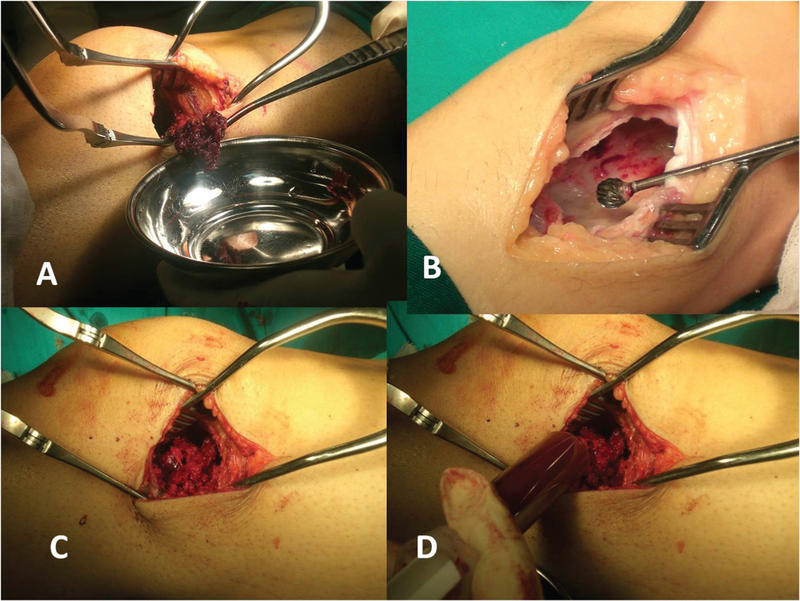 In this series, four patients had intra-articular fracture and all treated by a single surgery by extended curettage bone grafting, minimum internal fixation and spanning external fixation, and all outcomes were successful ([Figure 5] and [Figure 8]). Extended curettage, ISP bone grafting, and spanning external fixation is a safe and effective procedure for the treatment of juxta-articular GCT of the bone around the knee. Raskin KA, Schwab JH, Mankin HJ, Springfield DS, Hornicek FJ. Giant cell tumor of bone. J Am Acad Orthop Surg 2013; 21:118–126. Frassica FJ, Sim FH, Pritchard DJ, Chao EY. Subchondral replacement: acomparative analysis of reconstruction with methyl methacrylate or autogenous bone graft. Chir ‎Organi Mov 1990; 75(1 Suppl):189–190. O’Donnell RJ, Springfield DS, Motwani HK, Ready JE, Gebhardt MC, Mankin HJ. Recurrence of giant-cell tumors of the long bones after curettage and packing with cement. J Bone Joint Surg Am 1994; 76:1827–1833. Review. Remedios D, Saifuddin A, Pringle J. Radiological and clinical recurrence of giant-cell tumour of bone after the use of cement. J Bone Joint Surg Br 1997; 79:26–30. Quint U, Muller RT, Muller G. Characteristics of phenol. Instillation in intralesional tumor excision of chondroblastoma, osteoclastoma and enchondroma. Arch Orthop Trauma Surg 1998; 117:43–46. Mjöberg B, Pettersson H, Rosenqvist R, Rydholm A. Bone cement, thermal injury and the radiolucent zone. Acta Orthop Scand 1984; 55:597–600. Jones LC, Hungerford DS. Cement disease. Clin Orthop 1987; 225:192–206. Smith S, Naima VS, Freeman MA. The natural history of tibial radiolucent lines in a proximally cemented stemmed total knee arthroplasty. J Arthroplasty 1999; 14:3–8. Glasser D, Langlais F. The ISOLS radiological implants evaluation system. In: Langlais F, Tomeno B, editors. Limb salvage: major reconstructions in oncologic and non tumoral conditions. Berlin: Springer Verlag; 1991. pp. 23–31. Enneking WF, Dunham W, Gebhardt MC, Malawer M, Pritchard DJ. A system for the functional evaluation of reconstructive procedures after surgical treatment of tumors of the musculoskeletal system. Clin Orthop 1993; 286:241–246. Campanacci M, Baldini N, Boriani S, Sudanese A. Giant-cell tumor of bone. J Bone Joint Surg Am 1987; 69:106–114. Blackley HR, Wunder JS, Davis AM, White LM, Kandel R, Bell RS. Treatment of giant cell tumors of long bones with curettage and bone-grafting. J Bone Joint Surg Am 1999; 81:811–820. Wada T, Kaya MM, Nagoya S, Kawaguchi S, Isu K, Yamashita T et al. Complications associated with bone cementing for the treatment of giant cell tumors of bone. J Orthop Sci 2002; 7:194–198. Gitelis S, Mallin BA, Piasecki P, Turner F. Intralesional excision compared with en bloc resection for giant-cell tumors of bone. J Bone Joint Surg Am 1993; 75:1648–1655. Conrad EU, Enneking WF, Springfield DS. Giant-cell tumor treated with curettage and cementation. In: Enneking WF, editor. Limb salvage in musculoskeletal oncology. New York, NY: Churchill Livingstone; 1987. pp. 916–919. Bini SA, Gill K, Johnston JO. Giant cell tumor of bone. Curettage and cement reconstruction. Clin Orthop 1995; 321:245–250. Alkalay D, Kollender Y, Mozes M, Meller I. Giant cell tumors with intraarticular fracture. 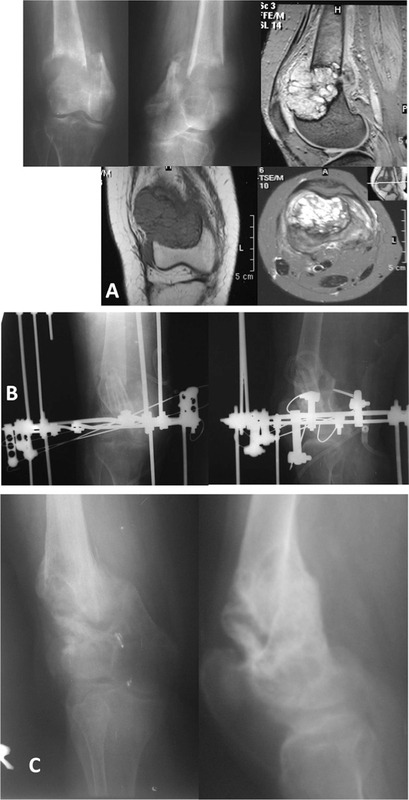 Two-stage local excision, cryosurgery and cementation in 5 patients with distal femoral tumor followed for 2–4 years. Acta Orthop Scand 1996; 67:291–294.